We’re headed into the season of holiday indulgence. Usually, the week before Thanksgiving, I try to watch what I’m eating because from Thanksgiving until the end of the year, there are a myriad of temptations to enjoy and, though I exercise a fair bit of self control, my threshold for resistance is low. 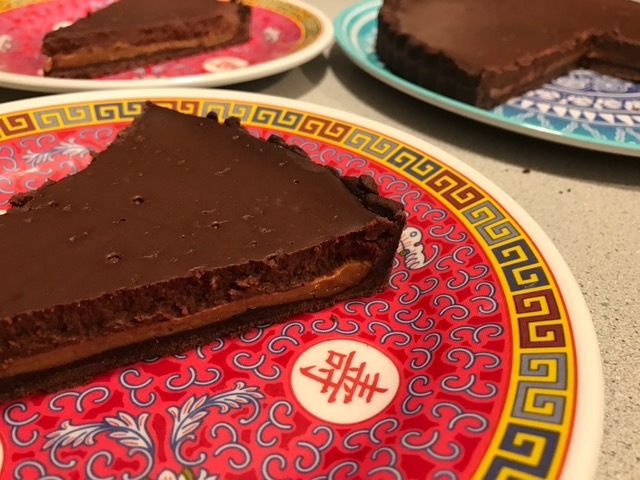 This week’s selection for Cook the Book Fridays, Chocolate-Dulce de Leche Tart from David Lebovitz’s My Paris Kitchen, threw that plan out the window. Chocolate is not normally my thing. Certainly, it’s never my first choice in the dessert department. 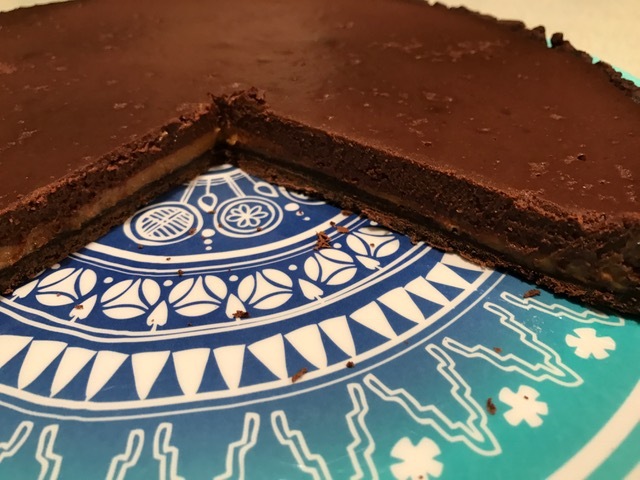 This recipe with a chocolate crust, a layer of caramel-y dulce de leche, and a layer of chocolate custard is one that I’d never pick on my own. In fact, I’ll admit I dragged my feet on making it. But, even though I waited until the last minute, I knew Howard would like it so I soldiered on. The first step was to come up with dulce de leche. What fun! I skipped the supermarket and turned it into a simple DIY project. All that’s needed is a can of sweetened condensed milk, a mason jar, and a slow cooker. 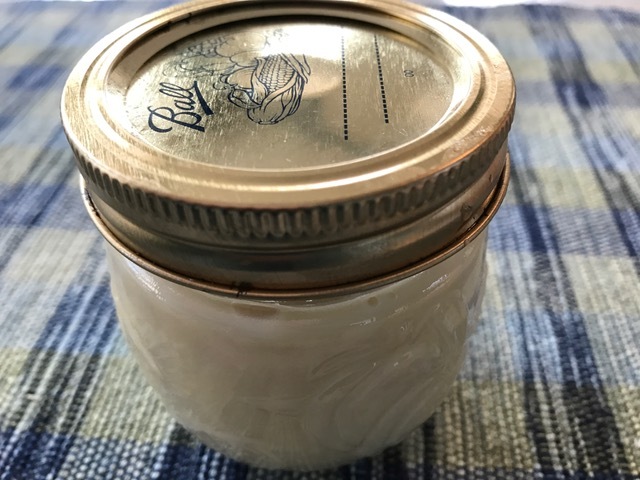 I poured the milk into the jar, screwed on a two-part top, placed the jar in the slow cooker and covered the jar with water and turned the heat to LOW. Ten hours later, the milk transformed from ivory to a golden brown. Plus it tasted amazing. I love press-in crusts, and that’s what this recipe called for. The chocolate cookie crust came together easily in the stand mixer and pressed into the pan just as easily. There was no salt in the pastry, but a light dusting of fleur de sel before par-baking added the right touch. 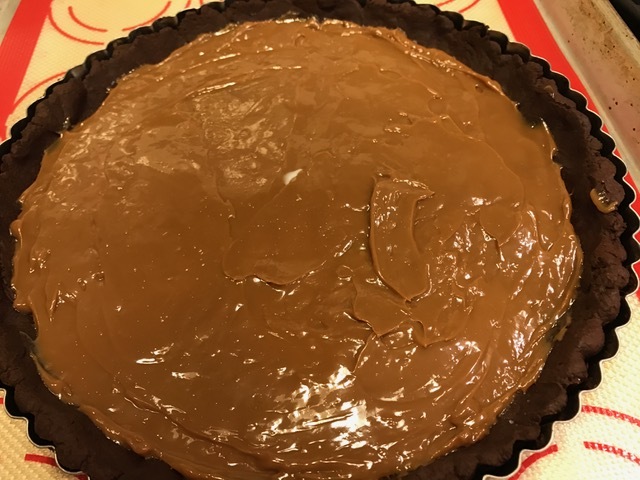 To pull it all together, the dulce de leche is spread over the warm crust, then topped with a chocolate custard that was made while the crust baked. Finally, another sprinkle of fleur de sel to cut the sweetness before returning the filled tart shell to the oven. The tart is baked, and then, after turning off the heat, it sits in the oven some more. I thought it was rather wiggly, so I left it there even longer. I got a late start. By the time the tart was done, it was bedtime, so I put it in the refrigerator where it set up nicely. I had extra custard, which I put in a ramekin for a chocolate pudding snack. It also firmed up nicely in the fridge. I was so glad I made this tart. It was rather indulgent and very delicious. As expected, Howard really liked it, but not so expectedly, so did I. Though we will enjoy it for an after-dinner treat for a few days, there are better ways to showcase it. It would better appreciated as a contribution to a holiday pot luck or dessert for a dinner party. I encourage you to try out this tart over the holiday season. You can find the recipe here on Williams-Sonoma’s website. You can also find it on page 289 of David Lebovitz’s My Paris Kitchen. This book has more than its share of winners, so it’s worth treating yourself if you haven’t already. And to see how my friends enjoyed their own tarts, follow links to their posts here. 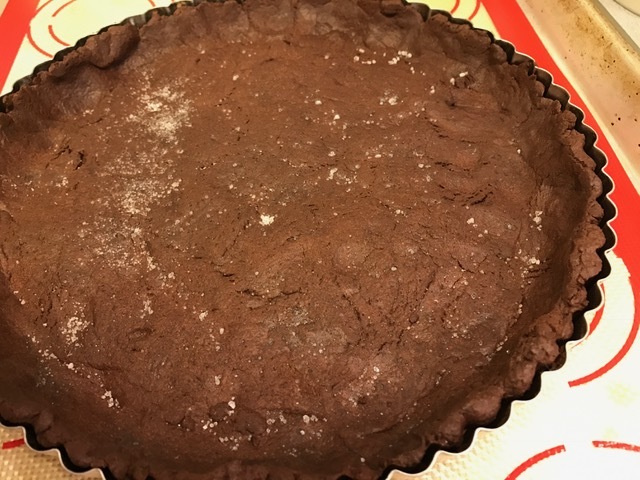 Posted on 18 November 2016, in Baking, Cook The Book Fridays, my paris kitchen and tagged chocolate, Cook The Book Fridays, my paris kitchen, tarts. Bookmark the permalink. 10 Comments. There are so many of you making the dulce de leche from scratch well done. I just ran to the store. Your tart looks great. We found it to be rather rich so we all had a small slice so it was enough for 11 people. Whoa, sounds seriously decadent, luscious and delicious Betsy, so I can see how that put a bit of a dent in light eating just prior to Thanksgiving. Nevertheless, it sounds positively worthwhile! Wishing you and all of your family a very Happy Thanksgiving! Lovely tart! I’ve made half a recipe, for two mini 4-inch tarts. We enjoyed it in small little wedges! perfectly. I also love using a press in tart dough, and this one was delicious. I think this was a winner all around and yours does looks gorgeous. I love the press in crust – always use it. Your tart looks amazing – I bet it would be rich, but man, it would be good. I agree re the potluck and it’d be really great as mini-tarts! Yours looks amazing, Betsy, and I like your slow cooker dulce de leche!! I’ll have to try that sometime. I know there’s at least one other dulce de leche recipe…I think?…so maybe then. Hope your Thanksgiving was lovely and happy December! Your tart looks beautiful! I will remember your technique for making the dulce de leche when I get around to making this.